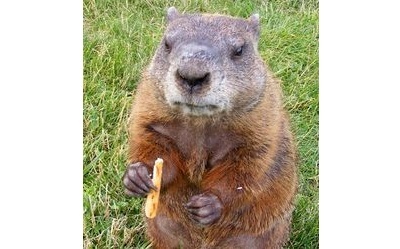 Breakfast With The Groundhog – You might invite this cousin of the squirrel to breakfast on Groundhog Day. It will politely sit up and eat without stuffing its cheeks. Groundhogs like to enjoy their meals on the spot and will take as long as two hours to feed. While their diet is mainly vegetarian, they also enjoy insects and snails. You might serve escargot sans sauce to thank the little guy. If the weather report is to your liking, that is. It will not turn its nose on the occasional egg either. Raw, please. For conversation, discuss its various names: Whistle-pig, land-beaver and woodchuck. Over 1.5 Million People Will Call In Sick Today – The day after the Super Bowl. “It’s got to be the least productive work day of the year,” observes Josh Moore, owner of 4for4 Fantasy Football. In 2013, Moore initiated a White House petition to proclaim the Monday after the Super Bowl a National Holiday.- Learn more on ibtimes.com. And The Gift Certificate Winners Are… On January 30th, on our Facebook page, we asked, “Which of these outsells all the others when a major storm is on the way?“ THE ANSWER… POP TARTS! Floods and hurricanes of the recent years have had a huge impact on our lives and, apparently, on how we shop prior to a storm. Large-surface retailers were surprised by the shift in purchasing habits. Flashlights, candles and canned goods remain high on the list of necessities, but Pop-Tarts, more specifically Strawberry Pop-Tarts, outsell these by almost 7 to 1. Your Answers: Pop Tarts (37%), Batteries (31%), Candles (21%), Canned Foods (11%). Three randomly selected winners received a $10 Gift Certificate. Visit our Facebook page for our daily Food Moods and Menu Recommendations, food facts, Captured Moments and The Monday Magazine too. Enjoy.